The United Kingdom has long been known as an international hub of yellow tabloid journalism. The News Of The World, one of the nation's largest tabloids, is famously in court right now because of the deplorable methods it used to acquire salacious information about interesting people. It appears, given their recent string of video game related reportage, that daily newspaper Metro has also had its fair share of morally dubious reporters on staff. The first piece in question ran on the front page of The Daily Mail on Monday. The headline reads "Sailor Ryan Donovan's 'Grand Theft Autostyle gun spree' on nuke sub". It details the sad story of a clearly disturbed young sailor in the British Navy who killed his commanding officer and attempted to kill two more men. It turns out he was also a Grand Theft Auto player. Thus, we get the resulting headline. Even worse is the strapline beneath, which reads "Crewman Ryan Donovan who killed an officer in a gun rampage aboard a nuclear submarine told friends he was planning 'a Grand Theft Autostyle massacre'." The body of the story says instead: "He started talking about the video game Grand Theft Auto, where you start a massacre and rack up points by killing." 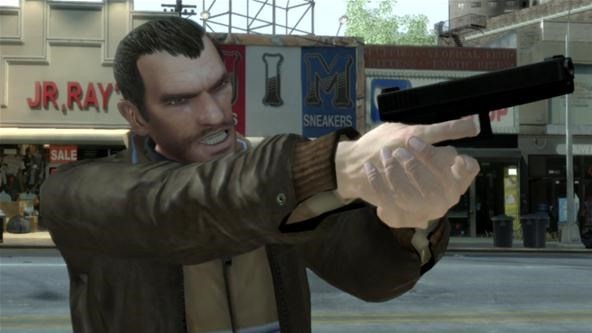 Yes, Grand Theft Auto does include the semi-famous Massacre minigames. But telling his friends that those exist is a lot different than telling them he was planning one. I would have taken the fact that he prefers to be called Reggie Moonbeam, also mentioned in the story, as better evidence of his mental instability than his GTA massacring. Besides, if Donovan had said something as suggestive as that he was actually planning a massacre, wouldn't his audience have said something? His fellow crewmen would be easy targets- submarines are not large places to hide from an armed shooter. The very next day, another video game scare piece ran on the very same front page. 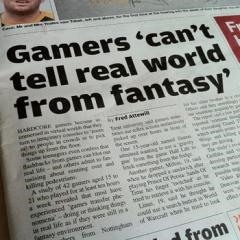 It details the "findings" of a Nottingham Trent University study titled "Game Transfer Phenomenon in Video Game Playing: A Qualitative Interview Study" beneath the lurid headline "Gamers can't tell real world from fantasy, say researchers". The piece explains the proposed existance of 'games transfer phenomena' by which games start to insinuate themselves into people's everyday lives. An example: "One 15-year-old named Simon admitted wanting to use a 'gravity gun' from the game Half Life to fetch something from the fridge." 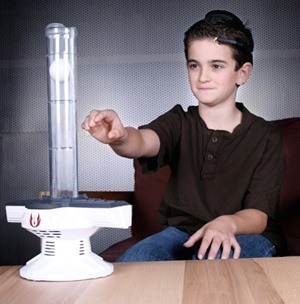 Because NO ONE (including the kid below attempting to use a force-powered toy) had similar fantasies inspired by Star Wars or any high fantasy novel long before video games developed the social influence they have today, several US game news outlet summarized the story, labeling it as a serious problem. "'For one thing, we never said that in our paper,' the Professor said, 'and for a second thing, the findings don't even hint at that. The press release I put out yesterday regarding this study was completely neutral, not one negative thing in there. The Metro, they obviously had an agenda - because all [the reporter] said was that he just wanted to know about the negative stuff. I told him that the paper was primarily positive, or at least neutral. He said 'I don't want to know about that, I want to know the negative stuff.' So I just went through what we did, what we found and what we are doing next. That paper has exactly what we said and what we didn't say. The Daily Mail had an advance copy of that paper for about 48 hours, in fact, and the journalist was reading back sections to me. So she knew what was in it, but decided to just write her own story anyway.'" He went on to say that the study was too small to be representative, and was strictly preliminary. Pretty damning stuff from a man who seemingly would have little to lose from the article running as it was, but apparently he has more integrity in his toenails than Metro seems to have on staff. The UK is home to some brilliant journalism in the world as well, including game sites like Rockpapershotgun and Edge Magazine, which feature some of the best writing and reporting in the industry. Sadly, much of their mainstream news press has a lot of catching up to do.